A few people I know would tell you that I am stubborn. The fact is - yes I am. Once in a staff training the instructor used me as an example (a good one - thank goodness.) He described me as "tenacious." I leaned in to the woman sitting next to me and stage whispered "That is just a nice word for stubborn." There were several snickers from those who have worked closely with me. What is the difference between being stubborn and tenacious? Mainly it is in the implication. Tenacious is generally used for someone who hangs on until something is completed. Stubborn is used more for people who will not give up because they want their own way. When you are creating or learning a skill, stubbornness is not a bad thing. I believe I showed my spinning wheel here before. I have become a decent spinner with wool. 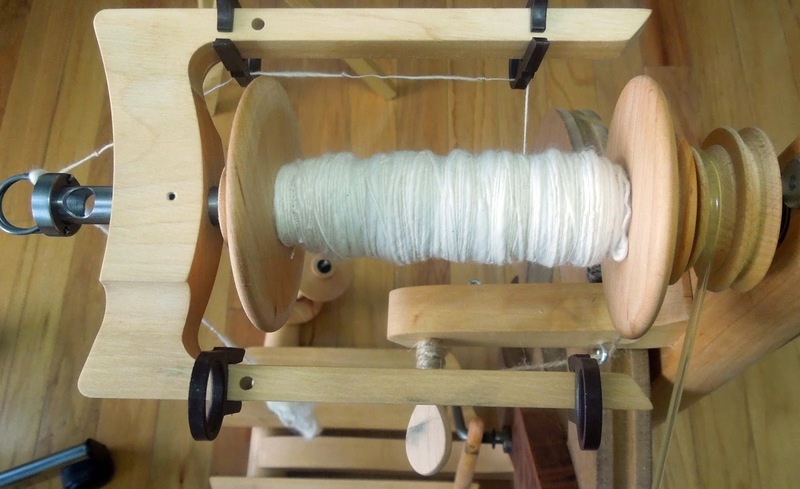 But a while back, I ordered some cotton to spin. 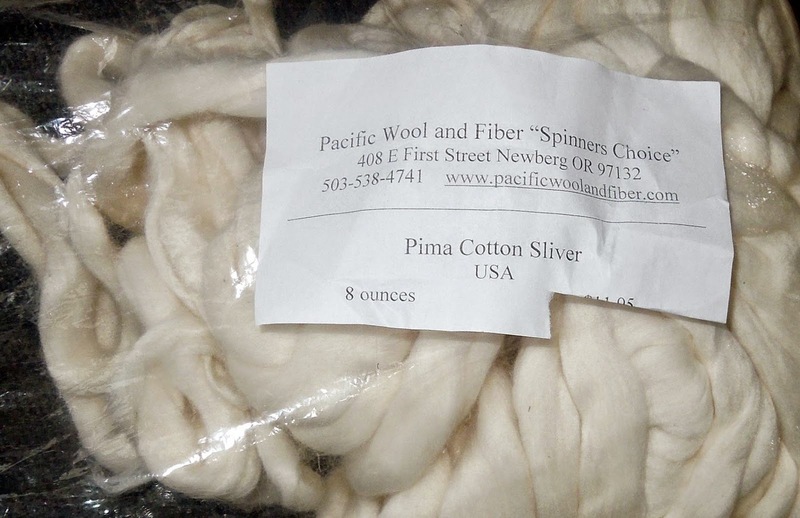 I got the good stuff - Pima Cotton Sliver (sly-ver) - because I was sure it would be easier to spin. 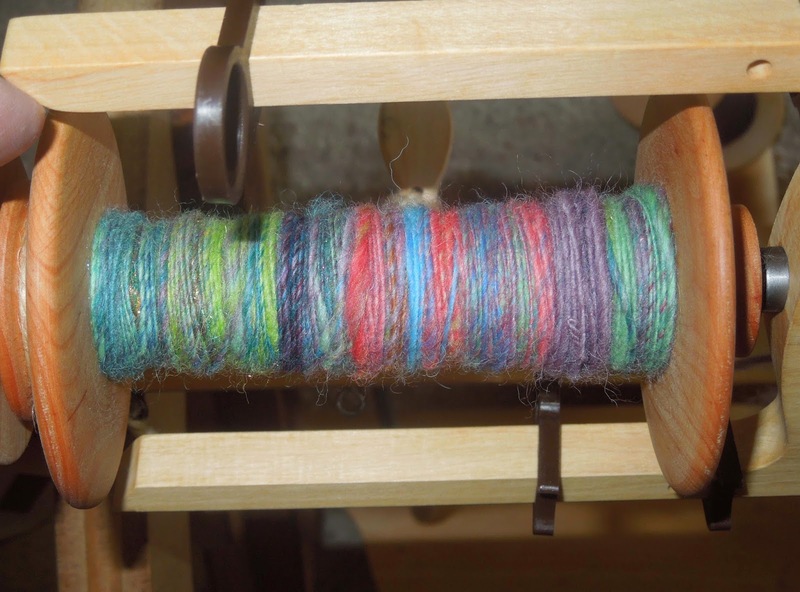 For months, it has frustrated me - first on the drop spindle and then on the wheel. 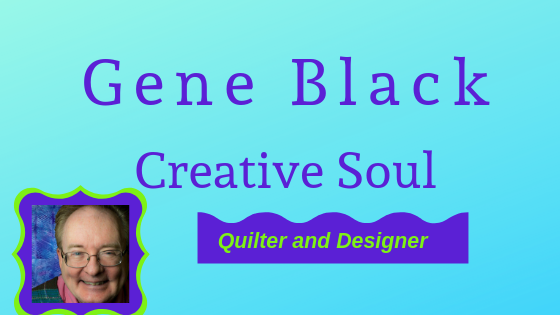 I also wanted to be able to blend the fibers that I dye easily. So, since one of my friends is an Ashford dealer, I asked her about a blending board. She didn't have one in stock - but it is on order. Meanwhile, she has loaned her board to me. 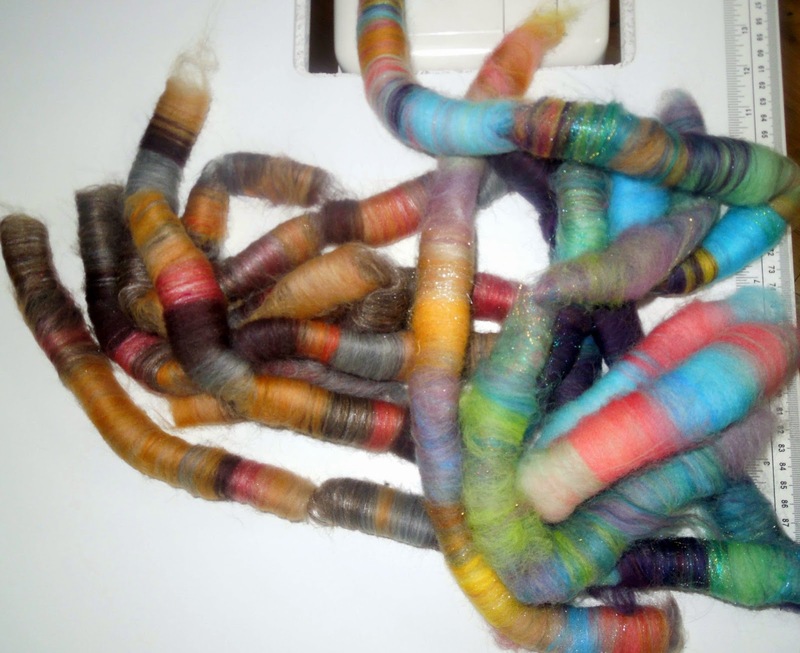 So I have been making these blended fiber put ups called "rolags." 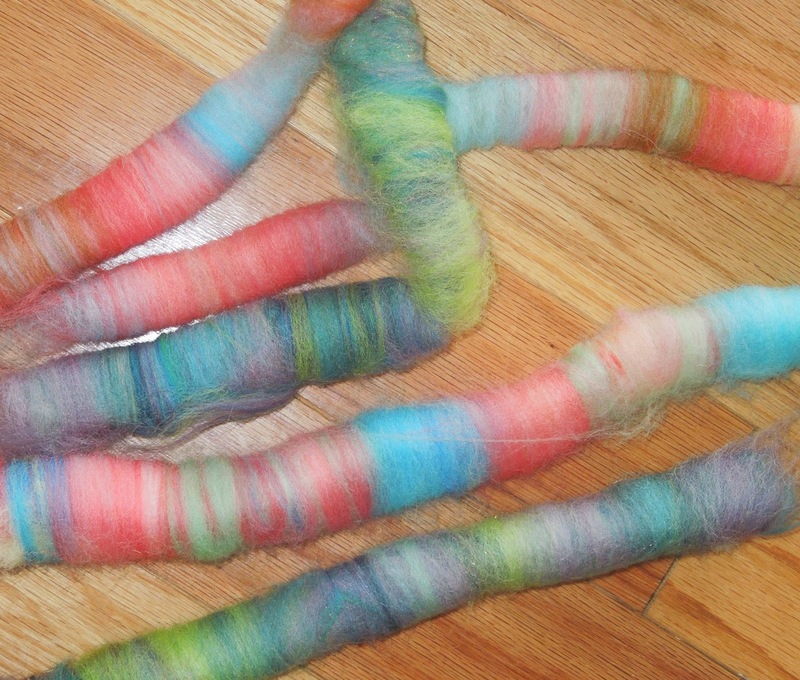 The are fun to make and spin into yarn. 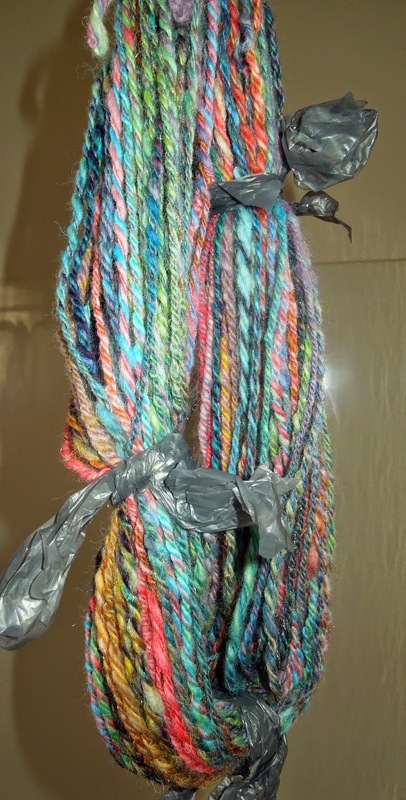 I spun several (not pictured) into this lovely yarn that is hanging on the shower rod to dry. I decided that maybe I could blend the cotton with the wool and use it that way. So I did a couple of small rolags and spun them. It didn't spin up easily so I let that idea go for a bit. Of course I went to Google and started searching for a way to blend the two. No luck in that search but I did find a video that I had watched once before on spinning cotton. So I tried again - yes, I am STUBBORN. So what if I am stubborn? - I did it! And I can repeat it. What is one of your worst faults? 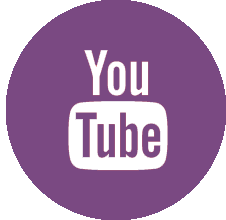 Have you found a way to channel it and "use it for good"? Stubborn is definitely a trait of mine. However, it's probably worked more against me than anything else. Oh well! Maybe I'll learn to channel into something good one day. Congrats, Gene, I admire that kind of persistence. I have a stubborn streak too, but only to a point. That's when I shift gears. If something isn't working, I turn it into something else. In fact, I have a project like that now. I stitched on it all afternoon yesterday and don't like it, so today it will become something else. Validation comes more quickly, and life is so short. Lol! Without tenacity ..... I would never finish any projects Gene. Stubborn / tenacious who cares what they call it....I call it finished. Remember that peacock I made a few years ago? If I asked myself once, I asked myself 20 times...."how high are you willing to jump to get this done?" I jumped day and night...and tore out tons....but it got done thanks to tenacity! I love that colorful yarn. and from now on, you are Tenacious G.